Do you manage a sawmill? If you do, then knowing the cost of your logs is simply non- negotiable in today's competitive marketplace. 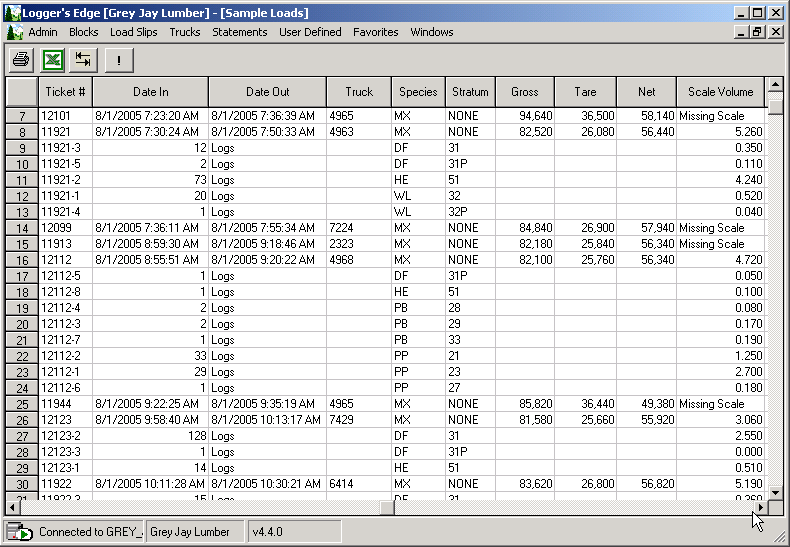 Caribou's log management software – The Cutting Edge - is a Windows based application designed to help sawmills manage their fiber procurement operations more efficiently. With The Cutting Edge, you can reduce time spent on the contractor settlement process and simultaneously gain access to better business information, all in the same process. Once your accounting staff has prepared the contractor settlements, your business reports are ready for review immediately --- no more after-the-fact, manual compilation of settlement data into the costing and production reports you need to run your business! Compare fiber costs and delivered volumes across suppliers and across different species/products at the click of a button. Easily compare depletion values against lump-sum purchase prices for blockstracts of timber that you purchase. Manage your standing inventory more tightly by comparing actual deliveries against cruise volumes on a blocktract or job basis and by species/product at any point in time. Improved data accuracy through the system’s data set-up and rate validation features. Our product is developed and supported by people who know the forest industry. We cater to small sawmills searching for user-friendly and budget-friendly solutions. Our goal is to make every customer a reference site, so you can be assured that we'll do our best to provide you with the best product and service in the industry, bar none! Setup wizards for ease of creating new blockstracts/jobs and new contracts. 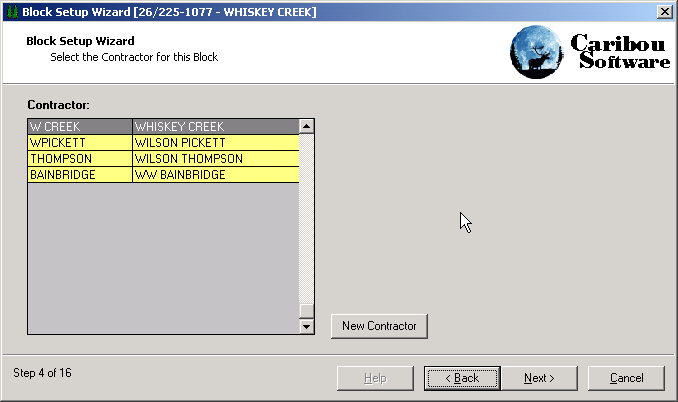 Extensive copy capabilities throughout the system. Excel-compatible data entry grids and reports. Active flags on all setup data tables allow you to hide old information from day-to-day view, while still preserving the information for historic reporting. Manage advances, holdbacks, and miscellaneous deductions. 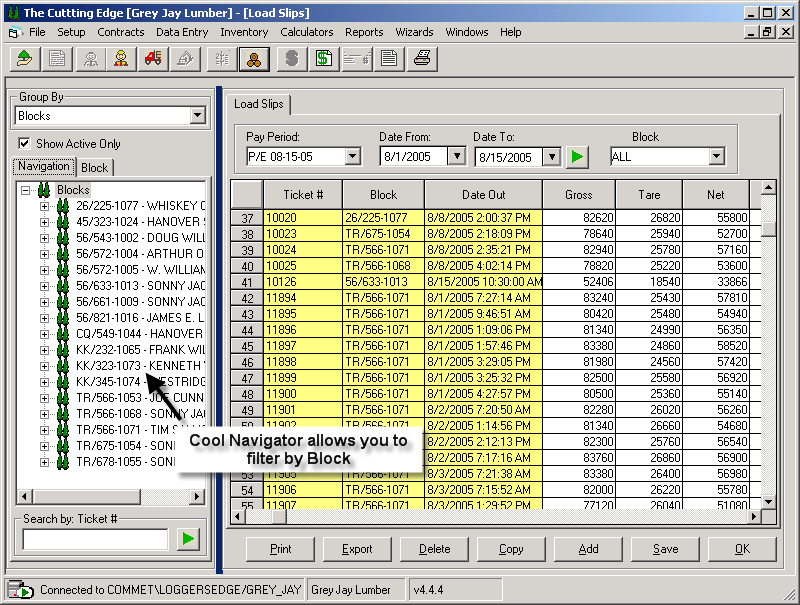 Configurable, electronic log scale import capabilities from hand-helds. Configurable labels and fields to match the terminology of your business. Weigh scale system integrated with main software for seamless sharing of information. Quick-and-easy search interface to look up load slip information by ticket number, by date, by blocktract/job, or by truck. Ability to track hand-scaled volumes for high-value hardwood and to track weights on tickets for lower-value wood, using conversion factors to convert the weights to volume measures such as mbf, cords, or M3. Handle payment in different units of measure, such as tons/tonnes, mbf, cords, cunits, cubic meters, or distance. Ability to pay multiple vendors (e.g., logger, trucker, landowner) in different units of measure (e.g., tons, mbf, M3) on the same load slip. 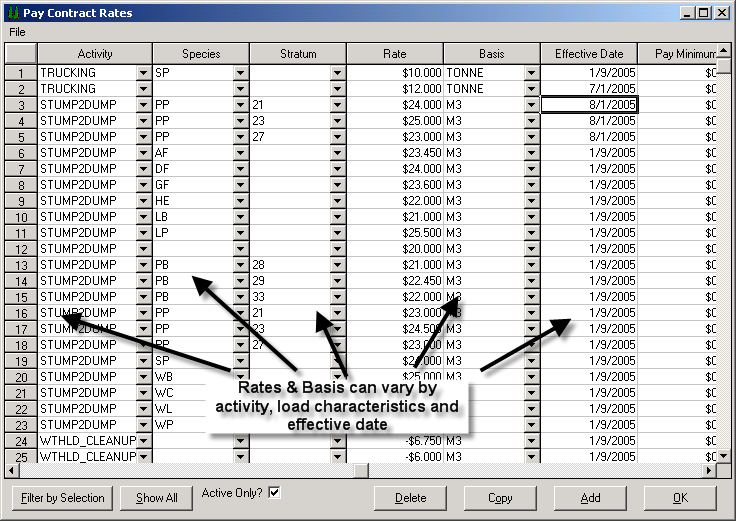 Handle different rates for up to ten factors, including such factors as species, sort, grade, or product. Manage different types of timber purchases, including depletion on lump-sum timber purchases, stumpage on pay-as-cut timber purchases, or simple gatewood purchases. Ability to pay a base minimum payment for short loads. Ability to track and deduct for overloads. Extensive set of standard reports for tracking information such as costs and production by supplier, and costs by blocktract/job. Track production against cruise data broken down by species, product or grade. Analysis reports that provide details on settlements, harvesting costs, stumpage, depletion and trucking costs. Reports in worksheet format that can be easily transported into MS Excel for additional analysis or charting. User-defined reporting tools for users wanting to build their own reports. Value-added custom report-building services to provide you with information specific to your business practices.